Visual BCD Editor is an advanced graphical user interface (GUI) version of Windows bcdedit command line tool. It is the first GUI tool to implement full editing of Windows 7/Vista Boot Configuration Data (BCD) store. 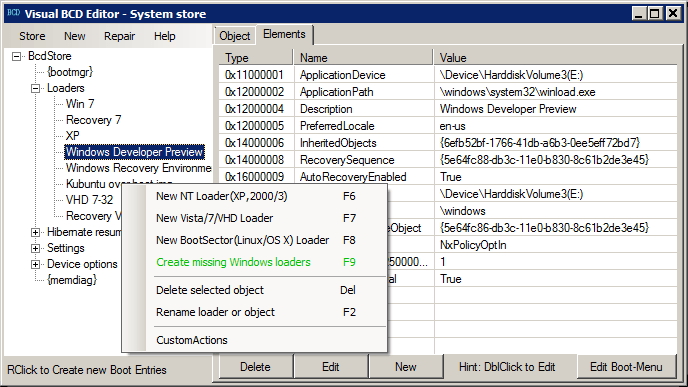 The tool gives a structured view of Windows BCD store with its explorer like interface and allows easy editing of all BCD objects and elements by novice or advanced users. The user can create, delete or edit every object like boot manager, loader or setting, add and remove elements with simple selections and clicks. See short introduction to BCD objects and elements. Visual BCD Editor allows complete editing of boot menu. Display order of loaders is only one characteristic. Windows 8 introduced graphical(metro) or text style boot menu which depends on numerous elements and other BCD tools hardly can edit all possible combinations of elements in boot manager, loader and settings objects which influence boot menu style. See details about text or graphic style boot menu. Visual BCD Editor implements unique automatic creation of loaders for Windows 7/Vista/XP and VHD installations in dual or multi boot systems (since version 0.9.2 of the tool) and so is the ultimate Windows 7/Vista/XP dual/multi boot editor. Update of the tool will follow for this functionality to cover Windows 8.x and Windows 10 loaders. A boot sector loader (for booting Linux, Mint, Ubuntu, Fedora, Mac OS X) is created with one click but needs manual creation of one additional boot related file with corresponding MBR/PBR boot code for chain loading the non-Windows OS. In development is automatic creation of GRUB based loaders for Linux descendants like Mint, Ubuntu, Fedora. New in version 0.9.3 of the tool is handling of Custom Bootstrap Actions - boot-time keyboard shortcuts to loaders which allows activation of (eventually hidden) boot menu items on special keyboard keys from boot menu. Recommendation: Please read at least Visual BCD - implementation notes and short introduction to BCD objects and elements if you don't have some BCD knowledge before manipulating BCD! There is a reason Microsoft made BCD accessible only with administrative rights. Be careful when manipulating BCD and have always an accessible BCD backup and recovery media ready! Everybody makes mistakes ;) - mistakes against BCD could make your system unbootable! Creates a new empty boot configuration data store. VBCDE menu item "Store - Create New Store". Exports the contents of the system store into a file. This file can be used later to restore the state of the system store. VBCDE menu item "Store - Backup store". Restores the state of the system store by using a backup data file previously generated by using the /export option. This command deletes any existing entries in the system store before the import takes place. VBCDE menu item "Store - Import store". This option can be used with most BCDedit commands to specify the store to be used. If this option is not specified, then BCDEdit operates on the system store. VBCDE menu item "Store - Open Store". Visual BCD Editor operates by default on System store. When another store is opened all operations are against this opened BCD store. Dropping a BCD file on VBCDE's icon opens that BCD for editing. Makes a copy of a specified boot entry(or other objects) in the same store. VBCDE Popup Menu item "Copy object"* on the selected object. Creates a new entry(object) in the boot configuration data store. VBCDE can create application objects, settings objects and device settings objects. These new objects do not have elements (elements can be created with separate operations). VBCDE can create complete boot loader objects with all default elements for following Windows OS: Windows XP, Windows Vista, 7, 8*, 8.1* and Windows 10*. More than that VBCDE can create autoMagically on one go complete boot loaders for every installed Windows OS which is accessible either on internal hard disk, external USB disk or VHD(virtual hard disk). More than that VBCDE allows the creation of custom bootstrap actions which are in essence keyboard shortcuts to boot loaders. Custom bootstrap actions are not available on UEFI maybe by the decision of the UEFI working group(?). All these create operations are available from VBCDE menu entry "New" and sub menu entries and from objects popup menu entries "New NT loader - XP/2003", "New OS loader - Vista,7/8*/10*", "New PE .wim loader"* and "New boot sector loader (for Linux, OS/X)"
Deletes a specified store entry(object). VBCDE "Del" key on selected object or object popup menu "Delete object". VBCDE has a "Rename object" operation accessible over "F2" key on selected object or edit of corresponding "Description" element. /deletevalue - VBCDE equivalent is "Delete" on elements tab. /set - VBCDE equivalents are either create new element or edit element operations. There are about 200 element types implemented by Microsoft and it makes no sense to list them all here. by default VBCDE displays all available information in the store for every object and element so it displays even more detailed information than bcdedit. Eventually a future version of VBCDE could include a setting to display fewer details. /toolsdisplayorder - separately available boot options like memtest. Visual BCD Editor implements all boot manager options(elements). The main element here is "displayorder" which is the base of Windows Vista,7,8,10 boot menu. See also our special tool "BootNext" which manipulates (not only) "bootsequence" element. Visual BCD Editor implements all EMS options. Visual BCD Editor implements all debugging options - see "Setting kernel debugging". In the latest version of the tool for the general public the user can create and change the value of more than 140 properties/elements of BCD objects. Other similar utilities give access to not more than 20 properties. All used constants, names, objects and elements are as defined by Microsoft. There is no difference if you use bcdedit utility or Visual BCD Editor for creating, changing or deleting objects or elements in BCD store as the tool uses standard Microsoft programming interface for BCD access. Runtime requirements: .NET Framework 2.0 (and/or .NET 4 with simple fix of configuration file). The tool has not been fully tested on GPT/UEFI and Windows 7/8 but editing should be possible on all elements. Repair and export/import of BCD should work as well. Dual-boot Repair tool - automatic one-click repair for dual or multi-boot systems based on Windows 10/8/7/Vista. Accompanying Dual-boot Repair tool is part of Visual BCD package(also available as separate download) and needs .NET Framework 2.0 or .NET 4 and Windows XP as a minimum. It can repair the MBR, partition boot records (PBR), Windows BCD and the disk structure by simple selections and clicks. The tool offers automatic one-click dual-boot repair for non-booting Windows 10/8/7/Vista in the scenario of a dual or multi boot system with Windows 10/8/7/Vista/XP. Windows bootmgr problems are fixed as well.